Carte de l'Asie centrale hellénistique (2017-2018) . Retour page principale C. Rapin. Rapin, C., 2015: «On the way to Roxane 2: Satraps and hyparchs between Bactra and Zariaspa-Maracanda», in : J. Lhuillier, N. Boroffka (edd. ), A Millennium of History: The Iron Age in Central Asia (2nd and 1st millennia BC), Archäologie in Iran und Turan 16, Darmstadt: Philipp von Zabern, à paraître. 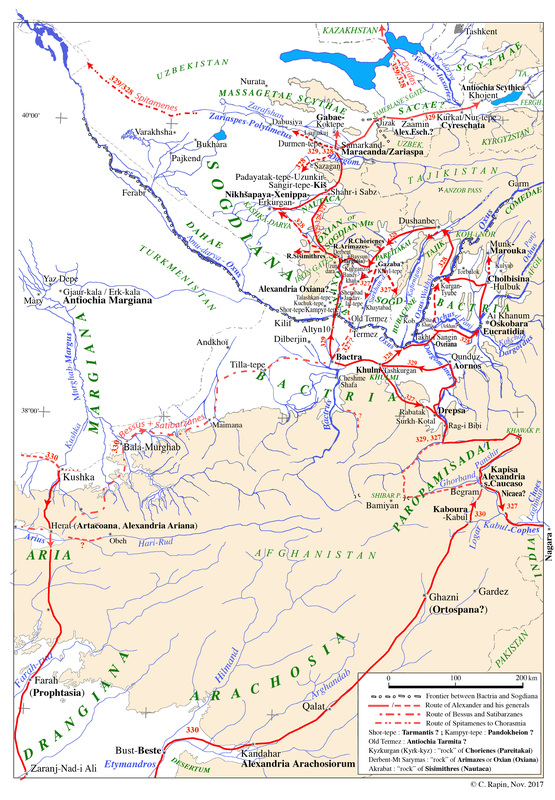 Rapin, C., 2013: «On the way to Roxane: the route of Alexander the Great in Bactria and Sogdiana (328-327 BC)», in G. Lindström, S. Hansen, A. Wieczorek, M. Tellenbach (Hrsg. ), Zwischen Ost und West – neue Forschungen zum antiken Zentralasien, Archäologie in Iran und Turan 14, p. 43-82. Rapin, C., 2014: «Du Caucase au Tanaïs: les sources de Quinte-Curce à propos de la route d’Alexandre le Grand en 330-329 av. J.-C.», in Alexandre à Rome, éd. M. Lencou-Barême et J. Trinquier, Paris, p. 141-186. Rapin C., 2017, «Alexandre le Grand en Asie Centrale. 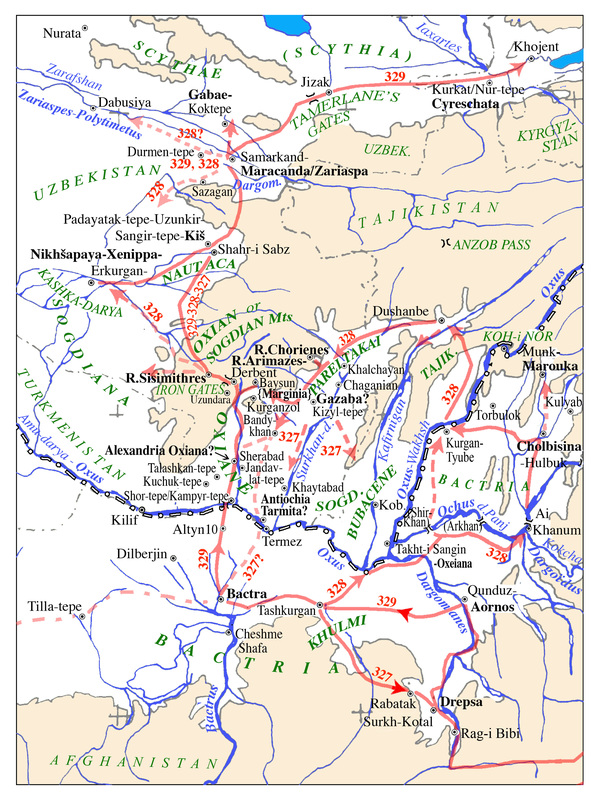 Géographie et stratégie de la conquête des Portes Caspiennes à l’Inde», in Moving East and back to West: With Alexander in India and Central Asia, ed. C. Antonetti & P. Biagi, Oxford, Oxbow Books, p. 37-121. Rapin, C., 2018, «How Alexander entered India». With a note on Ortospana (the ancient name of Ghazni?) by F. Grenet. The Journal of the American Institute of Afghanistan Studies, p. 141-181.